Are you in the market for new carpet for your home? It can be a daunting task. It’s not a process you do on a regular basis, and with the amount of choices available to you, where do you begin? Because it’s something you purchase infrequently, don’t make common mistakes and regret your purchase almost as soon as it’s installed. These are the most common mistakes we see people making; avoid these and you’ll love your purchase from the moment it’s installed. When making a major purpose, we like to find ways of distinguishing good, better, best. So when we see carpeting described by face weight, it’s easy to assume one is better than another based on numbers alone. However, when it comes to carpet, many factors play into the final decision. A 50 oz carpet isn’t necessarily better than a 40 oz one. There are many other factors to take into consideration, such as twist, density, materials, etc. Some will elect to place all of their money in the carpeting, assuming what’s visible matters most. Unfortunately, this is one of the worst mistakes you can make. 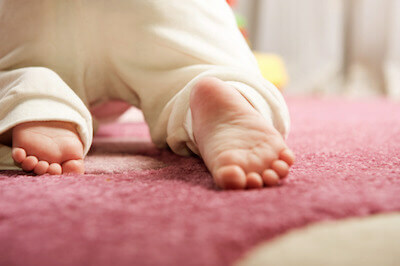 Padding saves on wear and tear for your carpet by absorbing the impact of foot traffic. A better grade pad will feel more comfortable to walk on, and perform better for the long term. This holds true if you’re getting quotes from different retailers on different products and brand names. Just because they look the same doesn’t mean they are. Be sure you are comparing on the same level: are they made from the same fiber, are they the same style, do they offer the same warranty, will they be installed in a similar manner? Flooring is one of the most important parts of your home. You walk on it every day. And if it isn’t installed correctly, problems will surface immediately. Like frayed edges around the baseboards; bubbles and ripples in the middle of the rooms. Many warranties stipulate that carpet must be installed professionally in order to be valid. So make sure to do your research and plan ahead if you are going to perform the install. Or, consider spending the extra money to save time and headache. Yes, you love your neighbor’s light colored carpets. But with a busy family, several kids and a cat and a dog, does light carpeting really make sense? Think about your needs before you hone in on a selection. Let a carpet rep offer advice based on how much traffic your carpets will see. Taking your own measurements gives you a starting point. But a reputable retailer will want to verify those measurements for you. It’s more complicated than adding up the square footage of your rooms. A retailer will account for the width or the carpet roll, the direction of the carpet pile, the individual nuances of your room. They will know when you’ve left out important pieces, and adjust accordingly. Oh, those special deals you find on television ads or in coupons or flyers. They seem too good to be true, don’t they? Yep, they are. If someone is charging a very low price for carpeting, they are making it up somewhere else. In order to stay in business, they have to make a profit, so there must be hidden charges to make up for the offer they pull you in with. If it seems too good to be true, realize it probably is.